1Q84 and attentive reading in the new millennium. In about a month, 1Q84 will join Not The Way It’s Supposed to Be on my attentive reading list for the year. I’m not sure there will be a post for every line on the reading schedule, but that is where I will be if you would like to read along or be ready with a guest post / posting on your own blog / notes in bottles / whatever it is that you do. Books for attentive reading have to be selected carefully. Book snobs aside, one rarely has the leisure. In this first week of Lent, I think of the Cistercian Monks a millennia back who would circulate their books on the first day of Lent. Each man would turn in the book he had the year before and be given a new book which would be his focus through Lent and for the rest of the year. Just one book. They had less than 400 years before Gutenberg and his printing press erased that focused world and flooded the reader with unimaginable riches. Just short of 600 more years and we panic as we realize that reading has become almost the same as not-reading. We determine to project manage ourselves into line. We break out our notebooks, our Post-Its, our highlighters. We catalog our books in Excel or Goodreads and save our notes in Evernote. We co-read and we blog, as I do here. We will be Excellent Readers! Reading a few things attentively somehow improves attention to things that are read lightly as well. One practices paying attention. It may even improve our entire lives, as we practice focus. We can’t quite define what it is, but it changes our brain function. (The term “attentive reading” is being taken up as a medical term.) Reading may be healing or transformational, but often it is less than that: a simple escape, a mere practicality. A recent blog dialog between Modern Mrs Darcy and The Deliberate Reader highlights the practical difficulties of determining which it is, and when. 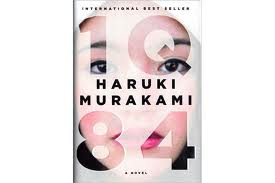 1Q84 seems to be a book that requires attentive reading and calls for loving reading. When a friend heard I was putting off reading it to re-read 1984 first, she advised me that it wasn’t necessary. If it’s not necessary, then why read the book? Of course that is pure snobbery because I could also put off reading 1Q84 for a few years and read Proust first as well. I won’t, but perhaps I will read it after. It breaks my heart to imagine readers rushing through 1Q84 so quickly that they can’t get to the outside material. Making such references is a gift to the reader and a true act of generosity in a artist as they point to a worthwhile world beyond their own creation. This is what it means to be a writer: To have made your world freely available, to have cashed in your ticket out of solipsism, and to have it ignored. Even a best-seller like James Pattison reaches a minority of readers. How many of those pay enough attention to his books, which do not ask for any attention at all, to allow him to break into their lives? Does Murakami care that his references are considered esoteric despite being freely given right there on the page? He had to know this would happen. Perhaps the act of reading past them is a performance art the reader has been manipulated into, a comment on the hopelessness of human connection in the modern world. Discussing this on Valentine’s Day my beloved says no, the hope of an artist is to make a connection some time but not every time. Perhaps even one time. When the only thing you’ve published to the internet is your match.com ad you say things like that. When you hit publish every day, you wonder how it can be that Murakami survives to allegedly writes of love.